The evening of Friday, May 2, there will be an All Church Worship Service at 7:00pm followed by a congregational meeting at 8:15pm to elect deacons, elders, and corporate officers. 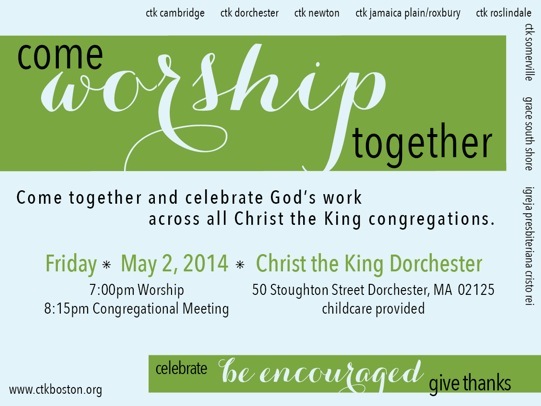 It will be held at Christ the King Dorchester (50 Stoughton Street, Dorchester) and all are invited to join. Childcare will be provided for children kindergarten ages and below, see event flyer here. For more information on the Officer Candidates who we will be voting to elect at the congregational meeting on Friday, May 2 please see their bios here.